It has been a long time since I last updated this blog. I am not really busy, I am just a bit preoccupied of being lazy. So what’s app? 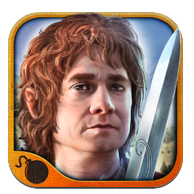 I’ve been playing The Hobbit: Kingdoms of Middle-Earth app for three days now. It’s really my first time to play an iOS app of that kind, where you can build your kingdom as an elf or dwarf and attack another kingdom or goblin hordes. It’s just for free! This app was developed by Kabam Inc. in cooperation with Warner Bros.
Resources. You’re going to need these throughout the whole game! You need to build and upgrade farms to produce food, arboretum to produce wood, quarry to produce stone and ore vein to produce ore. You also need these to build and upgrade other buildings like the Keep, the Academy, the Barracks and so on. Level of production per hour depends on the level of each building. So you’re going to wait for seconds up to hours to replenish enough resources for your next building. Usually, I am having a problem with my resources like wood, stone and ore. I seldom have the problem for gold and food. Name. My kingdom’s name is Isengard. It was the first name of a place from The Lord of the Rings which came out of my mind! Isengard was once the dwelling place of Saruman the White. I got a special item Naming Rights which I got from Gollum where I could change my kingdom’s name but I might not use it yet. My player name is Spalatrot. The root of this name is a secret. Quests. As Gandalf says: Don’t be a fool, follow the quests system! But I, most of the time, don’t follow these quests! (You’ll have rewards like resources after finishing a certain quest) My current primary quest is to upgrade my Keep to level 5 but I won’t likely to do that because my beginner’s protection will be lost which means I will be susceptible for attacks by other mightier kingdoms so I just try to accomplish some other quests. Warriors. You certainly need them to scout or attack other plains, mountains or kingdoms. Right now I have 220 porters, 121 mounted elves, 225 elven militia and 141 supply carts which give me a might of 1836. You need to train more of them to have a greater might. I tried to attack other plain but unfortunately I was defeated by goblins! When you were defeated in a war, your might will decrease. I was defeated three times! Awww. Hero. I chose Gandalf as my hero. He is the leader of my warriors. I need more mithrill to train him so that he’ll level up! Lo! I must protect my kingdom! He must be stronger than the hero of the attacker if ever. Alliance. Graill, a member/officer of our alliance named Lords of Endore accepted me. And he’s a Filipino too! I was so lucky I became a member of a rank 16 alliance. Some other higher alliance are just too (i don’t know the word) to accept me! I am now level 11 and still enjoying the game so far. Let’s see how long would I love to play this game. This entry was posted in Random Million and tagged app, app review, games, role playing game, rpg, the hobbit. Bookmark the permalink.